Specially developed for early childhood centres, spectrum+ junior provides the colour, choice of play activities, and above all, versatility which is essential for the 5 years old and under age group. With so many removable options, spectrum+ junior allows you to create a varied play environment from day to day, especially when combined with planks and trestles and so on from our Movable Equipment range. 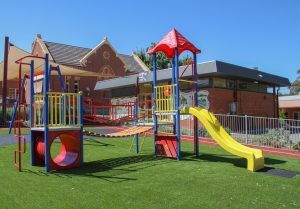 Of course every centre needs a basic fixed structure to provide a stable, safe and colourful focal point in the playground, and this system has a huge choice of play elements and layouts for this purpose. However, where spectrum+ junior really shines is the array of add-on components available to create a truly flexible play environment. spectrum+ junior incorporates unique construction features which make it quick, easy and economical to install. And because it is especially for pre-school age groups, there is a choice of platform sizes to create either compact layouts, or large open deck areas.